A Kent schoolboy has signed a £2m four-album record deal with Sony BMG. 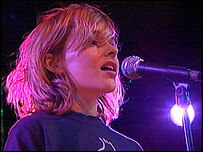 Joseph McManners, 12, from Canterbury, has finished recording his first album, "In Dreams" set for release in October. He was plucked from obscurity by a BBC talent search in 2004 and went on to play the lead role in the West End musical Oliver. The pupil at Simon Langton School for Boys said: "Everything is exciting at the moment. My school friends can't quite believe what I'm up to." Joseph added: "I can't wait for everyone to hear my new album." "In Dreams" is a compilation of Joseph's favourite songs which have inspired him during his childhood. When the schoolboy was first spotted by the BBC Talent Scheme he beat off competition from 25,000 other children to play The Little Prince in the BBC2 screened opera. Joseph's first album deal is worth even more than former child star Charlotte Church's, when she was signed by Sony Music in 1997, aged 11. In conjunction with the release of his album on 26 October, Joseph will perform at the Royal Albert Hall in London next month.